From standing (Tadasana), shift your weight onto one foot (left) then bend the opposite knee (right) and draw that foot back and up. Externally rotate your right arm and catch the inside of the right foot with your hand. Extend your left arm forward and up. Draw the toes and thigh of your lifted leg up towards the ceiling. At the same time, both press your foot into your hand as well as the opposing motion of drawing your rib cage forward and up in the opposite direction. You can tip your hips slightly forward to deepen the pose. Gaze forward or 45 degrees in front. To come back to standing pose, lower the raised leg drawing your thighs together and release the foot, stepping back into standing. Repeat on the other side. If you would like to simplify the pose you can, of course, use a wall for support. You can also keep your bent knee pointed towards the floor and your heel at your seat – ie not drawn back. This may be easier for balance. You can also play about with a strap by placing your back heel in a ‘loop’ and hold the strap with the same hand. This is another great pose for practicing the opposing forces of grounding and lifting. Ground down through the standing leg and at the same time lift the ribs off the hips and lift your back foot and your front hand. Dancer Pose improves your balance and strengthens the standing leg as well as stretches the hip flexors (front of hip) and quads of the lifted leg. It opens the chest and therefore allows full deep breaths in the front of the body. 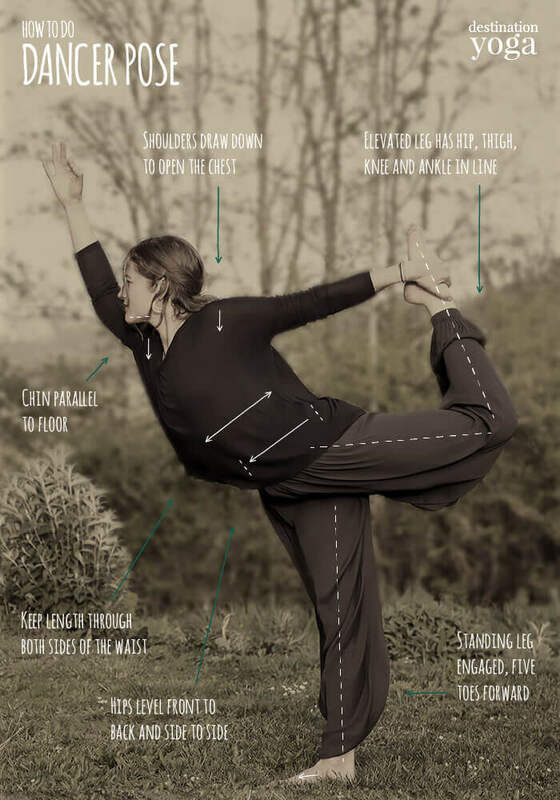 Don’t practice Dancer Pose if you have any knee or hip injury or if you are pregnant.